Seamless recruitment for small business. 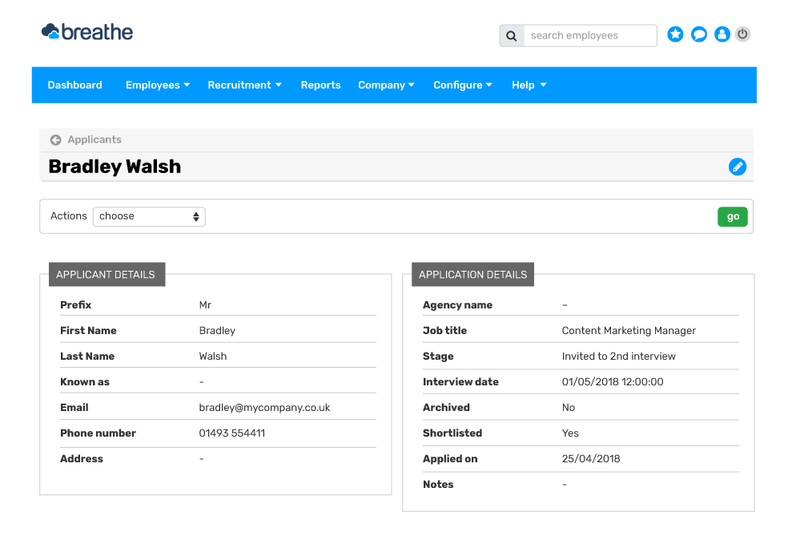 With a simple to use applicant tracking system, Breathe enables small businesses to manage their own recruitment processes from start to finish. Breathe enables users to create new vacancies and effortlessly assign them to a dedicated recruiter, helping to make the entire process seamless. Applicant tracking software (ATS) helps businesses manage all aspects of recruitment digitally. Sometimes referred to as talent management systems or applicant tracking systems, applicant tracking software enables automated management of the entire recruitment process. From creating job descriptions and advertising to receiving applications, screening candidates, applicant testing, scheduling interviews, checking references and completing successful candidate paperwork, breathe’s ATS system streamlines the recruitment process and makes it simpler. 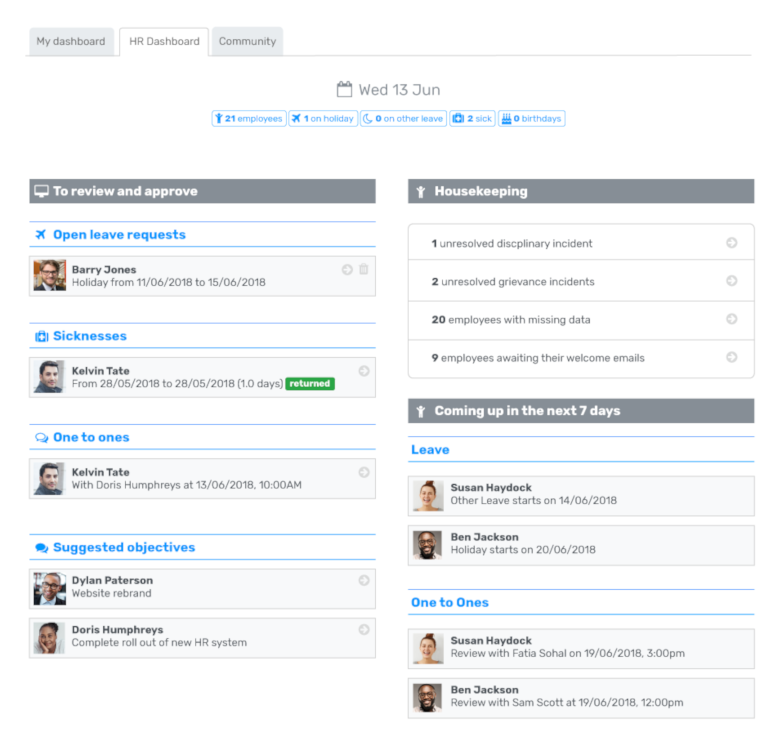 How does Breathe's applicant tracking system work? With Breathe's applicant tracking software everything gets collected and organised in a database automatically and digitally. You can advertise positions to online job boards in an instant, monitor progress as applicants move through the hiring process, review applications, schedule interviews, send rejection letters, mark candidates for future interest and much more. Breathe not only streamlines the recruiting process, it creates a professional footprint to impress potential employees. Kicking off a recruitment campaign is simple. 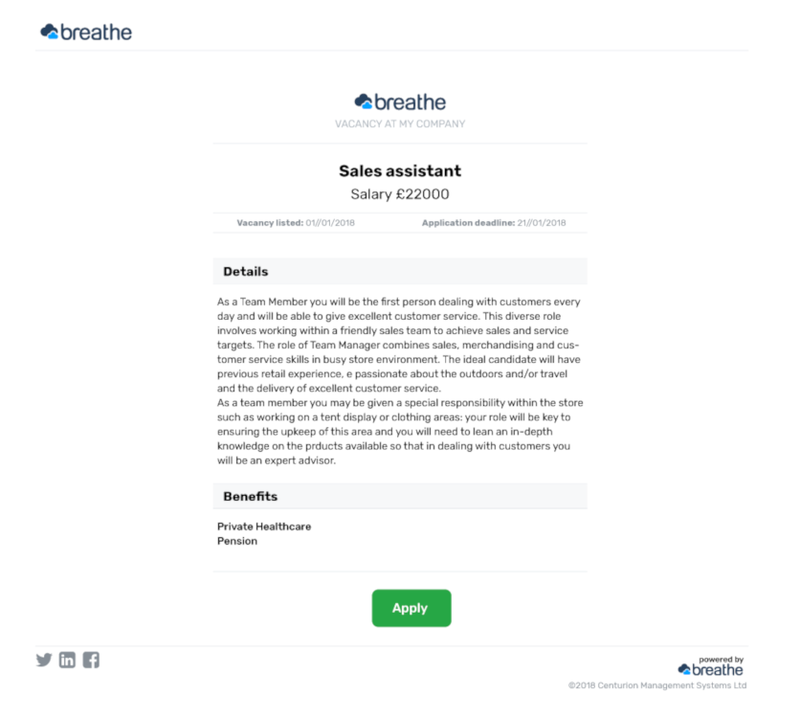 With Breathe's ATS software you can easily set up new vacancies, and include all the key information about the job ready to advertise on your company website. 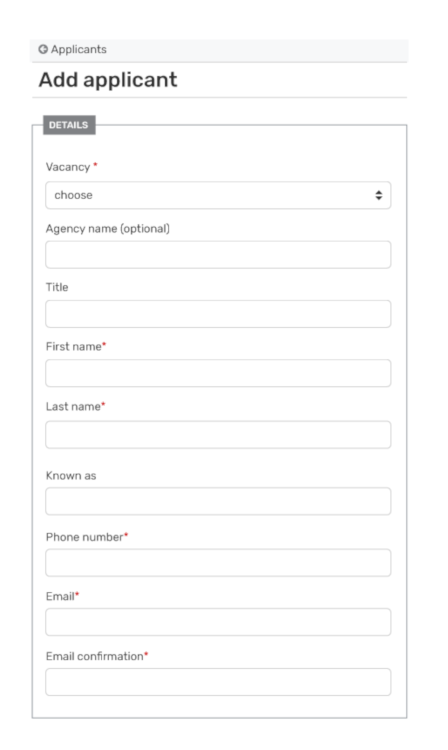 The standard online application form provides you with the crucial information you need to recruit the best staff, and enables applicants to upload additional documents such as their CV or a covering letter. With our easy-to-use ATS system, every applicant is automatically added into your recruitment hub. 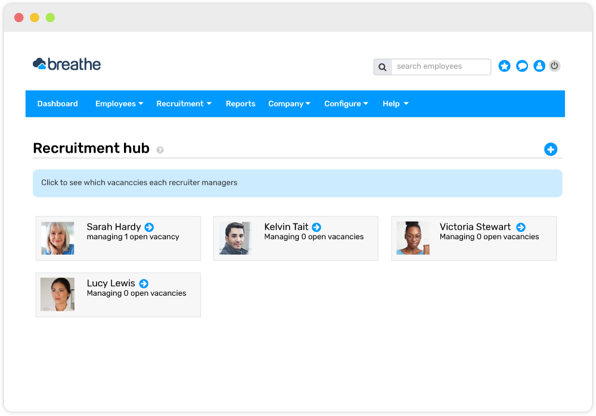 From here you will have the chance to add notes or tags, reject, archive, shortlist or invite the employee to an interview. Successful candidates can be transformed into an employee on the Breathe system in just one click! You can track every step of the hiring pipeline and cut out duplicate processes. Managing your recruitment campaigns in Breathe means your potential recruits get a snapshot of your flawless HR processes from the outset. Every candidate will experience your professionalism from their very first interaction with your company. From applying for the role, right through to being set up as a new employee and requesting their first holiday, Breathe supports an impressive user experience and adds to your reputation as a great company to work for. Keep hold of valuable talent. Just because someone didn’t get the job it doesn’t mean they weren’t suitable. The Breathe applicant archive allows you to keep a full record of every candidate that impressed you. Add simple tags to unsuccessful applications, such as key skills or attributes that really stood out, so that when you’re looking to hire in the future you can find them with ease. Snap up talent and reduce costs. To snap up top talent you’ll need to be on top of the recruitment game every step of the way. Our applicant tracking software enables you to refine your recruitment process and reduce the time it takes to hire. Reducing the administrative burden of the recruitment process will save your business money too. "I find the system really easy to use, lots of great features and great help from the live chat team."